Also serving communities of Chenoa, Pontiac. There are 9 Assisted Living Facilities in the Normal area, with 3 in Normal and 6 nearby. The average cost of assisted living in Normal is $4,245 per month. This is higher than the national median of $3,346. Cheaper nearby regions include Bloomington with an average starting cost of $3,164. To help you with your search, browse the 30 reviews below for assisted living facilities in Normal. On average, consumers rate assisted living in Normal 4.1 out of 5 stars. Better rated regions include Washington with an average rating of 4.8 out of 5 stars. Caring.com has helped thousands of families find high-quality senior care. To speak with one of our Family Advisors about assisted living options and costs in Normal, call (855) 863-8283. Normal, Illinois, is a college town next to Bloomington that was originally named North Bloomington. The name, however, was changed to Normal eight years after the Illinois State Normal University, which became Illinois State University, was founded there in 1857. About 9.6 percent of the nearly 54,284 residents are senior citizens, and three assisted living facilities are operating in Normal to support the community with six more in the nearby communities. In Normal, as with all of Illinois, assisted living facilities (ALFs) are expected to meet regulations and provide certain services, including meal service and assistance with cleaning and laundry. These communities are licensed and regulated by the Illinois Department of Public Health. Overall expenses in Normal are rated 89 against a U.S. median of 100, which may help seniors on a fixed income. Groceries, utilities and health costs are all less expensive than the national average. Housing is remarkably low at 79, which means it could be financially prudent for families to move to Normal to be near loved ones in an ALF. Weather in Normal is generally pleasant during the warmer months, with summer highs in the mid-80s. Winter months, on the other hand, can see lows of 15 degrees. The area receives about 30 inches of snow in an average year, which can complicate visits from relatives. The Normal area is home to world-class medical facilities, including Central Illinois Neuro Health Services and Saint Joseph Medical Center in the event of medical emergencies or illness. The violent crime rate in Normal is far lower than state and national averages. The property crime rate is one point lower than the U.S. average, which makes the town a reasonably safe place to retire. Normal is located in McClean County, which generally has low ozone levels and received a grade of "B" for its air quality from the American Lung Association. Seniors with respiratory health issues may need to beware of occasional heavy particle pollution that could have a negative effect on pre-existing respiratory conditions like asthma, COPD and lung cancer. Seniors may get a healthy dose of art and culture from various plays, exhibits and variety shows that are on or off the university's campus. ALFs usually provide transportation for these field trips to entertain the residents. Assisted Living costs in Normal start around $4,245 per month on average, while the nationwide average cost of assisted living is $4,000 per month, according to the latest figures from Genworth’s Cost of Care Survey. It’s important to note that assisted living rates in Normal and the surrounding suburbs can vary widely based on factors such as location, the level of care needed, apartment size and the types of amenities offered at each community. 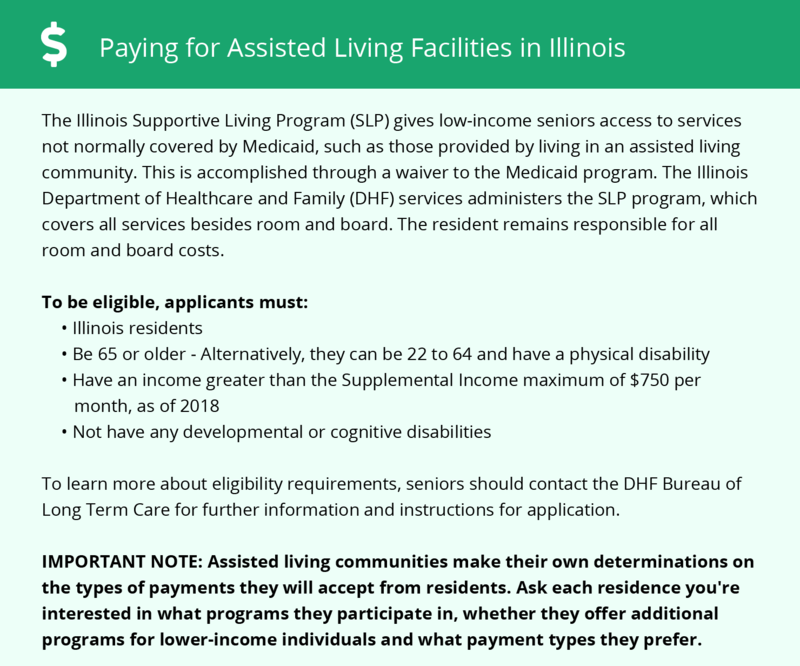 Seniors receiving Medicaid may be eligible for the Illinois Supportive Living Program and the Community Care Program, which help cover daily living expenses. Normal and the surrounding area are home to numerous government agencies and non-profit organizations offering help for seniors searching for or currently residing in an assisted living community. These organizations can also provide assistance in a number of other eldercare services such as geriatric care management, elder law advice, estate planning, finding home care and health and wellness programs. To see a list of free assisted living resources in Normal, please visit our Assisted Living in Illinois page. Normal-area assisted living communities must adhere to the comprehensive set of state laws and regulations that all assisted living communities in Illinois are required to follow. Visit our Assisted Living in Illinois page for more information about these laws.